My 6 top tips for sneaking-in more time for reading for those who ‘just don’t have the time’. NB: This is written from a stay-at-home parent’s perspective and doesn’t include more obvious (and perhaps dubious) ways of upping your reading time, such as going to the bathroom whilst at work in order to read, reading in your lunch-hour and reading whilst you commute. Six days ago I began an online exercise where everyday, for one hundred days, I photograph something that makes me happy and document it online: #100happydays. Reading has cropped up in my pictures at least twice, and for those who know me, this will come as no surprise. Yes I love books and reading, and what with it still being January and the season for goal-setting, one of my reading goals this year is to finish those series. You know, actually complete the Harry Potter books, and Millennium, and start and complete the Hunger Games trilogy. You get the idea. Much of my free time is spent thinking about reading, rather than doing, and so I’ve been contemplating how to turn this around. 1. Turn off the tv. This does seem to be an antisocial measure and one to cause unrest in the family home. The rest of my family ADORE the telly and I really can’t remember the last evening which didn’t automatically involve switching on the goggle box. So either I slope off to somewhere else (my bedroom) to read, or switch it off and incur the wrath of the boys, either way I am a baddie. I can only suggest either talking to your nearest and dearest and trying to explain and persuade what you want to achieve or else buy a set of Dr Dre’s and tune yourself into some music whilst you read. 2. Log off from the social media. Yes, it is much easier and in a duped, immediate-gratification kinda-way it is more fun to spend hours on twitter and Facebook but it doesn’t get books read. Keep logged-in to Goodreads, though, in order to update your progress and get suggestions for future reads. a) Go for books with short chapters. If you get interrupted or fall asleep, then you can pick-up from where you left-off relatively easily. Also, you feel as though you are making progress rather than getting bogged-down with text and often race through, thinking ‘just one chapter more’. I recently read ‘The Radleys’ by Matt Haig which had wonderful, short chapters. Armistead Maupin’s ‘Tales of the City’ books also have wee chapters and some others include: ‘Animal Farm’ by George Orwell, ‘High Fidelity’ by Nick Hornby and most books by Carl Hiaasen and Chuck Palahniuk. b) If you’re not enjoying your book then don’t be afraid to ditch it. If you join or reacquaint yourself with a local library and use this as a source of books then you won’t feel so bad about jettisoning a book that hasn’t cost you anything. 4. Reward yourself with reading. So you’re enjoying your book and it has short chapters. Instead of a walnut whip at the end of the day, or a glass of wine after tidying the kitchen, give yourself the joy of a chapter of your book. Better for your waistline too. 5. Join a bookclub. Having a deadline is a great way to ignore distractions and sharpen your focus on the page. a) E-readers have their place and I used to dig-out my Kindle from the inside pocket of my coat whilst waiting in queues for stuff, but back then I didn’t have a proper cover for it. The screen has since died and I have now made a bulky cover to try and prolong the new screen’s life. What I could do, and what I encouraged my brother to do, was to download an app that allows him to read his book on his phone. No excuses for leaving your book/ e-reader at home now. Unless you’ve left your phone at home, of course. b) Discover audio. My circumstances have changed recently and I am finding myself doing shedloads of driving. So I’ve borrowed a playaway device from the library and I’m ploughing my way through ‘Bring up the Bodies’. I get the audiobook for three weeks; it costs me £1.50 plus the cost of a AAA battery and earphones and I can also plug it into my ancient car’s tape adaptor. Playaway is a clever format in that I don’t need to spend time downloading or messing about with computers, discs or cassette tapes. It remembers where I stopped and is easily portable. Today I went for a long walk on my own and was immersed in Tudor England for the hour or so. Perfect. Bang goes the theory that I could be a social worker. This morning I spent the precious two and a bit hours when my son is at preschool, sat at St Bees, finishing this book and greeting. I’d found the first half of the book so-so but the last few days I have been sneaking in as much reading time as possible. Much to the detriment of the state of my house and me and my family’s diet. I’m making amends now. Also the Kindle is out of juice, so for the sake of myself, my poor husband, (yes I did fetch it out of my coat pocket during the interval at the opera on Sunday night), and my lovely, slightly malnourished children, I am not going to recharge it until I have got a handle on my household. It will be tidy and meals, (proper meals with vegetables and everything), will be planned and bought for. Then I will plan my next read. So what made me sink to such lows? The main answer would be the Weedon family. Not that I was modelling their lifestyle in the same way that some social commentators think that watching video nasties turns one into a serial killer, no. I think it was the glimpses into their chaotic and sad lives that hooked me in and made me worry for them and ultimately kept me reading the first few chapters of the book. We’ve been house hunting too whilst I’ve been reading this and unsurprisingly the class issues of various villages and areas kept playing through my head a la Pagford vs The Fields as we would stumble upon a house that wasn’t ideally suited to us but was in a desirable middle-class village with, say, a group that organises coach trips to Carlisle’s classical music concerts. Someone else snapped it up. Sigh. Of relief? So the moral of the story in ‘The Casual Vacancy’? Perhaps, I would argue, it is that politics is dangerous. But that’s not fair on Rowling. Really, the danger lies with egos and lack of concern for one another. So do fight for what you believe is right, but smile and look wide and when you think you’ve looked wide, look wider still. (B-P). Story vs Storyteller, or the Sorry Sequel. Unread books on my buckling shelves: yup. I’m fifty-two pages from the end of my current book, so as sure as a Lib Dem MP supports a disgraced colleague, my mind is chewing over what to read next. There’s plenty to choose from, including books seven and eight of Harry Potter; the penultimate and final books from the Millennium trilogy; and Mantel’s ‘Bring up the Bodies’. All this begged the question: why haven’t I tackled these sequels sooner? I thought about this yesterday and came to the conclusion that I read in order to experience ‘slices of life’. I’m not a one-genre girl and my mantra could well be ‘So many books, so little time’, and with this in mind, why waste precious time further delving into a specific author’s specific creation? The answer of course is the story. I should want to read book two because the story of book one was so enthralling that I don’t want it to end. This very rarely happens with me. What is more likely is that if I enjoy a book, I will seek out a book by a different author in the same genre, or from the same era or same country in order to develop depth and widen my experiences: the sequel can wait. And so these poor follow-ups, as good as they no doubt are, are left on the shelf whilst whim, fancy and the joy of discovery override story and they languish on my tight shelves alongside the Hunger Games trilogy and Alexander McCall Smith. So what WILL I read next? Perhaps I should make a final attempt to finish ‘Pickwick Papers’. Alternatively I have plenty of whimsy on my Kindle too. So many books, so many formats, so, so little time. Yesterday I had a dental appointment that I was quite looking forward to. It turned into root canal treatment with (at first) insufficient anaesthetic. I’m not looking back fondly on the appointment now. Apart from the clenched hands, rolling tears and closed eyes, what was going on with me? Prime numbers. Yes, dear reader, I got through the ordeal by thinking of prime numbers and I got as far as 601. The allure of the prime number has only struck me in later years. I didn’t enjoy maths as a youngster and ditched it as soon as possible, so thinking about numbers isn’t something I normally do, which is perhaps a good thing. I don’t mind prime numbers being associated with excruciating and expensive pain. So…. 601- mental pinnacle of the treatment; 71 minutes – the duration of the treatment; £321 – the cost of the treatment. I also got to 77% of my reading book last night (Life and Fate) and got up to episode 4 of series 3 of Breaking Bad. Oh, and 45 minutes waiting for a friend who failed to turn up for badminton (£4.20 – which was kindly refunded). 1. What book might you re-read in 2013? – I quite fancy having a stab at “Secret Diary of Adrian Mole aged 13 3/4” I first read this as a teenager and am sure I’ll get more out of it as an adult. 2. What local event made you proud of your community? – We went to a couple of ‘Lakes Alive’ events, but especially one called the Banquet at Cleator Moor which involved food, acrobats, storytellers and all sorts of cabaret. Then there’s the Olympics of course. 3. Do you have any reading challenges for 2013? I liked my friend’s attempt at reading 12 books from her shelves in 2012, so that might be a good one. The downside of the Kindle is that I now have the equivalent to a charity-shop book-buying habit, and my TBR piles both in real life and digitally are massive. 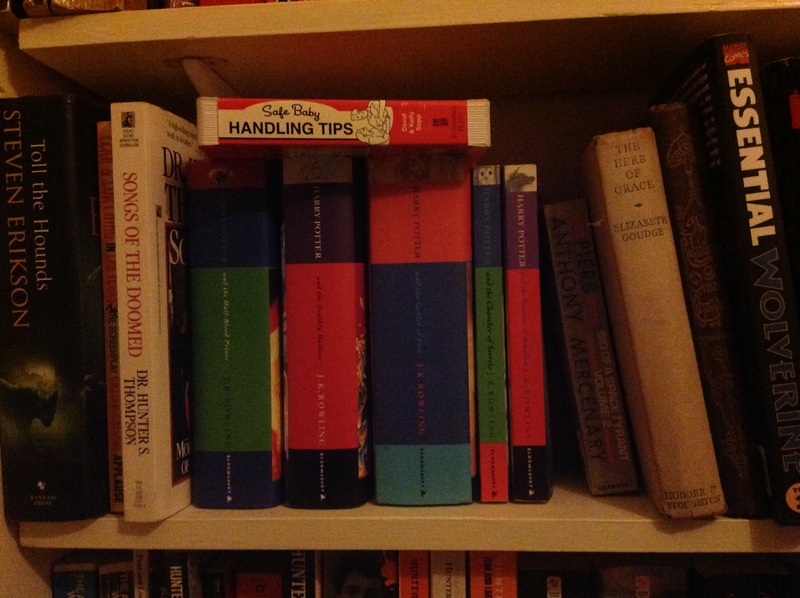 I would like to finish some series, namely the last two Harry Potters, and the last two Millennium books. 4. Do you have any creative resolutions/challenges for 2013? – Yes, I think I will try and post on here more once a week and comment meaningfully on comments left by friends. I might try and keep a diary but that always falls to the wayside. 5. Any housekeeping/domestic challenges/resolutions? – Try and continue to declutter and make a deadline for getting the house on the market. 6 . Facebook. Whatcha gonna do about it?! – Stay but perhaps create more filters and definitely visit less frequently. 7. What physical challenges do you have in mind for 2013? Well, I would like to do at least 30 mins exercise each day, ideally 60 mins. Also to resume badminton on a Friday night and to get out for a decent walk in the fells with the boys at the weekend. And to finish the Hadrian’s Wall walk we began in 2011. 9. What will be your tipple of choice this New Year’s Eve? Waggle Dance beer then bubbly. 10. Who do you wish you were seeing the New Year in with? My brother.